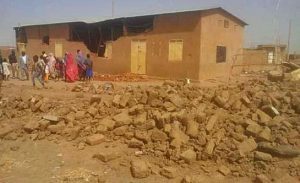 JUBA, South Sudan (Morning Star News) – Khartoum state authorities in Sudan demolished a church building yesterday (May 7) as Christians were preparing to worship, sources said. In the Khartoum suburb of Soba al Aradi, which began as a refugee camp for south Sudanese, a bulldozer sent by Jebel Aulia locality and the Ministry of Planning and Urban Development arrived at block 7 at about 2:30 p.m. and destroyed the Sudanese Church of Christ (SCOC) building, they said. Authorities had notified church leaders of the impending demolition just a week prior. The church building was one of at least 25 the Sudanese government designated for destruction last year. The government reportedly claimed the churches were built on land zoned for residential or other uses, or were on government land, but church leaders said it is part of wider crack-down on Christianity. Established in 1989, the building in Soba al Aradi was used by three congregations as it was the only one left in the area following the demolition of 12 area church buildings beginning in 2011. It included two offices for women’s and youth ministries, as well as a room for Sunday school classes. Christians in Sudan complain that the Islamist government of Omar al-Bashir is targeting their buildings while favoring Muslims and their mosques. “There is a nearby mosque in the area where the church building was destroyed, but it was not demolished,” said a source who requested anonymity. Christian lawyer Demas James described the move as a serious violation of constitutional and international conventions of human rights. Writing on Facebook, he said the fact that the building was destroyed on a Sunday shows the government’s lack of respect for Christian holy places. “You can see there is no place for worship left now for the believers to worship,” he wrote. Riot police and personnel from Sudan’s National Intelligence and Security Services (NISS) arrested SCOC members Bulis Salah and Naji Abdalla for refusing to open the church gate. They were taken to NISS offices, interrogated, and then released later that day. A June 13, 2016 letter from the Executive Corporation for the Protection of Government Lands, Environment, Roads and Demolition of Irregularities of Khartoum State reveals the names and locations of 25 church buildings marked for demolition, most of them in the Sharq al Neel (East Nile area) locality of Khartoum North. The government claimed the churches were built on land zoned for other uses. The Rev. Yahia Abdelrahim Nalu, moderator of the Sudan Presbyterian Evangelical Church’s (SPEC) Sudan Evangelical Synod, has told Morning Star News the subsequent order was part of a systematic attack on churches by the Islamist government. Hamad said the order was aimed at 27 church buildings, including the SCOC building in Soba al Aradi and one belonging to the Presbyterian Church of Sudan in Jebel Aulia. The order by Mohamad el Sheikh Mohamad, general manager of Khartoum state’s land department in the Ministry of Physical Planning, urged that it be implemented immediately. Among the 25 church buildings listed are three located on public playgrounds; the rest are located in residential areas, according to the order. The government’s decision to issue no new church building licenses came after South Sudan seceded from Sudan in July 2011, when Bashir vowed to adopt a stricter version of sharia (Islamic law) and recognize only Islamic culture and the Arabic language. Sudanese authorities on Feb. 17, 2014 demolished another SCOC church building in Omdurman without prior notice. 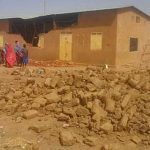 Bulldozers accompanied by local police and personnel from NISS destroyed the worship building in the Ombada area of Omdurman, sources said.